Gritty’s should be on every beer drinkers bucket list. At WeBlogBeers traveling far and wide for our readers to find the best places in America to get beer is not only our mission it’s our duty (insert “Star Spangled Banner” here). 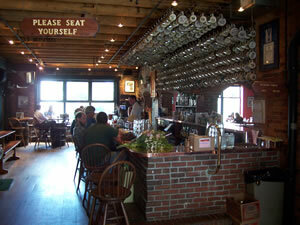 It is in this spirit that we recently visited Gritty’s of Portland, Maine. Located on Fore Street in the Old Port areaof Portland it’s a must addition to your bucket list. This pub is definitely worth the trip into the wilds of the Northeast. Full of colonial charm and the sweet, sweet smells of cider and beer that flash your nostrils as you cross the threshold, the clay mugs of the locals help you understand that this is the place to be if you want a really good locally brewed beer. Vacationland – An extra special golden summer ale with a crisp mouth feel and a nice smooth hop finish. Brewed April through August, this beer is tank conditioned just a bit longer to give it a smooth sunny texture, like its name suggests. Pub Style Pale – These types of beers are what made the craft beer industry what it is today. Gritty’s started brewing this type of brew, and today it’s a staple draft in the house. Black Fly Stout – Not the most appetizing name, but a dry, all-malt stout. This beer is reminiscent of the Irish stouts of the day. Clean with a rich smell and a smooth taste. One a day will not keep the doctor away, but it will make you feel good. 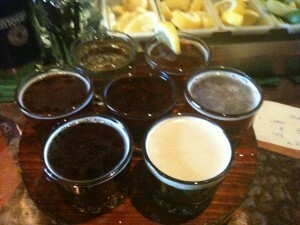 Red Claw Brown – The best beer in the house, this nutty, dark red is so good you’ll want to put it in your bathwater. A floral aroma and a smooth hop finish make this beer one to enjoy with friends, food and more friends…and some more food. IPA – Maine’s Best IPA (judge for yourself) starts with a hoppy aroma and taste and ends sweet. This golden brew is crisp, and if you are looking for a smooth IPA this is the one. Cider – I wasn’t a cider guy until I drank this…then I was remarkably transformed. Best Bitter Cask – Don’t know if I would consider this “best,” and I am not a cask fan, but as cask-style brews go this one is a fine choice. This beer has a great aroma but only delivers a very light body taste. Not particularly hoppy with a dry clean finish. So do yourself a favor, next time you’re in Portland, whether you’re staying there or on your way north for lobster or south for chowder, make a stop at Gritty’s. As they say in Portland, a-yuh, you won’t be disappointed. Yes we know this is a very high rating, but it is on the bucket list, so we are just trying to create some urgency. This entry was posted in Uncategorized and tagged ale, amber ale, beer, craft beer, irish stouts, portland maine, summer ale by weblogbeers. Bookmark the permalink.